ACE Ribbon Chargingis thenew concept of electrostatic coupling of the ribbons in the castle of the rotogravure and rotooffset high speed printing machines. It is a system consisting of two modular plates mounted opposite to one another, while the ribbons will run in the middle being loaded in a complete and homogeneous way. 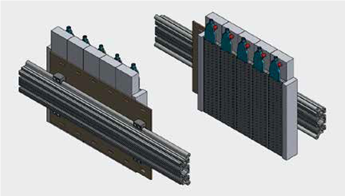 Each plate consists of a series of electrostatic charge high power bars, placed vertically and side by side. The individual elements are easily insertable or removable from the plate to allow an optimal coverage on the total width of the ribbon, without creating the problems of traditional bars that instead require protection on the parts that exceed the ribbon and which can create a dangerous arc. The two plates are mounted on a slide which can be moved manually or via a command from the machine control console, for they can be centred with respect to the strips and to adjust the power with respect to the number of strips and the time of permanence of the effect that is desired. In the case of a bar should be replaced, regardless of the simplicity of the operation, the other bars, part of that plate, can compensate for the charging effect necessary, thus avoiding the need to stop the production to make the repair. The installation of the system is quick and simple, in fact, the plate unit has been studied in order to be assembled with a few simple operations and also on fittings of other existing systems. The device causes the tapes being folded will remain firmly aligned in their run up to the storage cylinder. New conception of Ribbon Charging, two opposing plates, consisting of individual and interchangeable charging bars.